Garlic (Allium sativum), one of the most valuable foods, widely used as a flavoring in cooking, low in calories, rich in Vitamin C, Manganese, Vitamin B6 and sulfur compound called Allicin, responsible for the distinct smell of garlic, which is believed to bring most of the health benefits of garlic and treating a wide range of conditions and diseases. Garlic is going to help you with: common cold, high blood pressure, bad cholesterol, Alzheimer’s disease, dementia, fatigue, atherosclerosis, all sorts of cancers, coronary heart disease, infections, toothache, earache, warts, nasal congestion, allergies, diabetes, anemia, psoriasis and hyperthyroid conditions. The garlic’s pungent flavour is due to a chemical reaction in which released enzymes are triggering creation of sulfur compounds. That chemical reaction occurs when garlic is chopped or minced and the flavour is most intense just after garlic cells are broken. After a while flavour is less pungent and becomes more unpleasantly sulfurous. Garlic bulbs are not the only edible part of the plant. The flower bud of the garlic plant or green tops known as garlic scapes are edible and delicious too. Garlic scapes have slightly less intense flavour then garlic bulbs. Garlic scapes are especially delicious and tender when they are young and can be eaten fresh or cooked. If you are one of many people who cannot stand the taste of raw, freshly minced garlic and must cook it, you need to know that cooked garlic has five times less health benefits then the raw one. Cooking garlic destroys healthy compound known as allicin and garlic’s ability to protect against cancer and heart disease. The relationship between garlic and cancer prevention has been studied by many researchers. Most, but not all studies, suggest that higher intakes of garlic are associated with a reduced risk of cancer. Garlic contains bioactive sulfur compounds that are believed to have strong effects at each stage of cancer formation and may stimulate the immune system’s natural defenses against cancer formation. The ability of garlic to prevent and treat plaque buildup in the arteries has been recognized for some time. As reported by researchers, garlic shows significant promise in its ability to lower blood pressure, prevent calcium deposits and plaque buildup in the arteries, and even reverse artery plaque accumulation. According to traditional medicine and backed by some laboratory evidence there is a claim that eating a clove or two of fresh garlic during cold and flu season can reduce symptoms or prevent your illness entirely. Garlic’s flu-fighting abilities exist due to its powerful antimicrobial and antiviral properties. Yes, you can use the garlic to get rid of this an inflamed blister in or near the mouth. 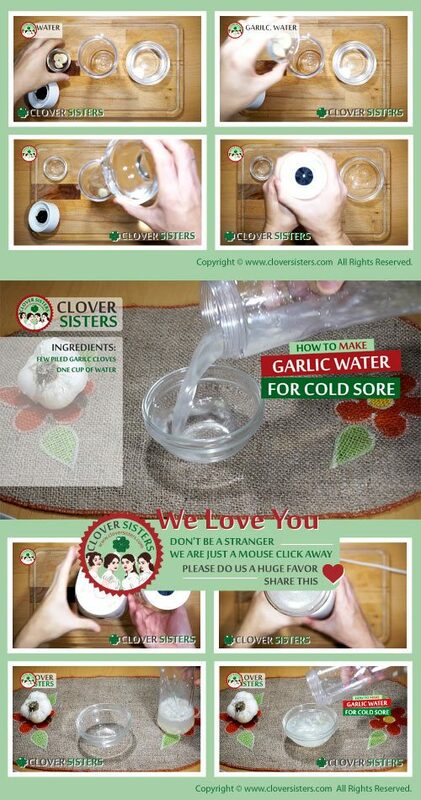 This garlic remedy for cold sore is very easy to make and very practical, but not very pleasant to use. Simply, blend together a few piled garlic cloves with the one cup of water in your blender. Use this smelly, sorry, this garlic water topically for the blister near the mouth or swish it around in your mouth for the blister in your mouth few times a day until the cold sore is gone.